Thriving gardens herald the return of fluttering friends! Butterflies, bees, hummingbirds and other pollinators are fun to watch but also critical for healthy gardens, ensuring plants are cross-fertilized and able to bloom their brightest. In honor of National Pollinator Week, which takes place June 19-25, 2017, the experts at Pike Nurseries have the buzz to help gardeners keep landscapes a welcoming pollinator oasis. Planting a butterfly garden in the backyard is one of the simplest ways green thumbs of all kinds can bring life and color to their landscapes. Following a 10-15 day metamorphosis from crawly caterpillars, butterflies initially emerge into a new life with clear wings. Many are unaware that the vibrant patterns seen by the human eye are actually tiny scales reflecting the sun! In addition to providing more color to backyards, these fascinating creatures keep plants cross-pollinated to produce vibrant flowers and delicious produce, keeping gardens happy and healthy! Build a Healthy Habitat: Butterflies are very delicate and prefer to seek shelter on plants that will protect them from nature’s harsh elements. Shrubs with larger leaves, such as laurels and anise, provide the best places for them to land. Gardeners looking to attract pollinators to their yard can also consider butterfly houses as favorable options for these fluttering friends to make their home! Provide Fresh Food: Along with nutrients gained from the nectar in flowers and the leafy goodness of shrubs, plants producing berries also attract pollinators. Establishing a garden that is friendly to butterflies provides an aesthetic benefit while also creating a dependable food source throughout their life. Food for caterpillars: Host plants, such as dill, parsley and fennel, are particularly important for butterflies in the early stages of life. Crawling caterpillars consume a lot of food to gather strength for their transformation, eating through much of these popular herb host plants. Gardeners should consider planting extra of these varieties if caterpillars have taken up residence! Food for butterflies: When butterflies first emerge from their cocoons, they begin the hunt for nectar to gain their strength. Gardeners can plant nectar supplying flowers, such as lantana, coneflowers and butterfly weed, that double as gorgeous color additions to the garden. Butterflies also enjoy tasting overripe fruit and can be placed in a butterfly feeder along with nectar to ensure plenty of tasty treat options! Create a Bath: Like most living organisms, pollinators need water to survive. To guarantee these colorful garden helpers are getting ample amounts of hydration, birdbaths or small saucers can be incorporated in a butterfly garden. Butterflies prefer shallow water and will not drink from open water, instead siphoning from moist soil. To create a station from which butterflies and birds can drink, stones, pebbles or even sand can be added into a shallow birdbath to create a variety of depths for drinking and bathing. Set up a Sun Soak: Unlike birds, butterflies are cold-blooded and need to absorb heat from the sun to warm their wings so they can fly. To ensure they have plenty of turf to soak up the rays, large flat stones can be placed in the garden for additional sunbathing spots. Butterfly gardens should be situated in sunny locations that are sheltered from the wind. Both kids and adults can learn more firsthand by attending Pike Nurseries’ upcoming free classes on attracting butterflies and other pollinators, lead by the experts at select store locations. Pikes Kid Series: Butterflies will teach kids the benefits of these buzzing friends while building their own butterfly feeder on Wednesday, June at 10 a.m. 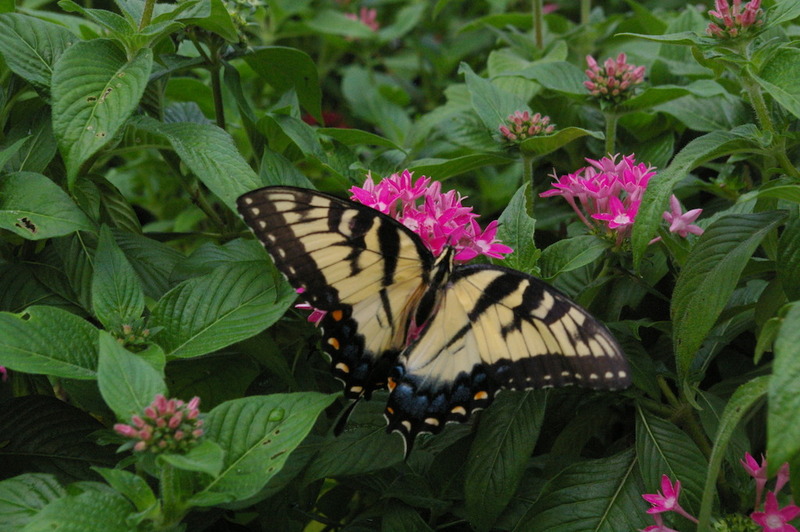 Adults can learn how to build the perfect pollinator garden during the Attracting Butterflies and Pollinators class taking place on June 13-15 at 6:30 p.m. and June 17 at 9 a.m. For more information on these free events and for location information, please visit pikenursery.com/classes. Whether installing a large landscape or a petite patch of flowers, Pike Nurseries has everything families need to begin planting the seeds for a stunning sanctuary for pollinators. For more fun facts on butterflies as well as tips to create a butterfly garden, please visit pikenurseries.com or stop by any of the 17 Pike Nurseries locations and speak to the garden experts. Augusta, Ga – A Hidden Jewel in Georgia Waiting to be Discovered by YOU this Summer! I hope to have a yard some day, I definitely want to create a setting for butterflies - and hummingbirds!